A highly pantomimish staging, in English, of the darkly comic 1928 play with music by Brecht and Weill about low-life deceit, two-timing, and corruption based on John Gay’s eighteenth century ballad opera The Beggar’s Opera. There’s not too much to the plot. Polly Peachum (Kelly Kaduce), daughter of Mr. Peachum (James Maddalena) and Mrs. Peachum (Michelle Trainor), has taken up with Macheath, aka Mack the Knife (Christopher Burchett) . Her parents are none too happy about it and connive to get Mack arrested and far away from Polly. Meanwhile, Polly goes off and marries Mack. That, however, does not save him from arrest. In addition to his generally nefarious activities, Mack has also been dallying with Lucy (Chelsea Basler) which gives rise to some further attempts by Lucy to remove Polly. Mack’s fate seems sealed but somehow the demands of an operetta-like ending take over and magic prevails. Though there are varying accounts of the genesis of this show, one of them suggests that Brecht and Weill wrote it as a goof while they were on vacation in England. They were very young men – Brecht was 28 and Weill was 30. Reportedly, the success of the show surprised even them. Oddly it has become the work for which their collaboration is best known. Operating in the 1920s in a Germanic universe whose degenerate spirit is visually captured by artists like George Grosz and Otto Dix, Brecht and Weill responded to John Gay’s portrayal of corrupt underworlds in London, and it’s not too hard to embellish that with classic portrayals of British low-life, like painter and engraver William Hogarth’s, or, later by novelist Charles Dickens, to get a sense of what might have additionally motivated them. Clearly, the addition of moodily unsettling influences from Vienna, which was leading the vanguard of a particular kind of Continental modernity at the time, make an interesting mix which probably created a unique chemistry that generated such pervasive appeal for this show. It was probably related to the reason why, when the Viennese genius Ludwig Wittgenstein showed up in Cambridge, England his work became such a tremendous hit. Apart from not much going on in the plot, there isn’t too much to the characters either. Mack is probably the most interesting, but we don’t really get to know all that much about him except that he’s a heel. He’s nefarious and has corrupt dealings with the police chief, Tiger Brown (Daniel Belcher), but why, other than Brecht’s later reputation as a strongly polemical political playwright, this show should be regarded as narratively significant remains something of a mystery. Though billed as a play with music rather than as an opera, there is some compelling music in the show. The introductory number, Mack The Knife, made wildly popular in the US in the 1950s by Bobby Darin, Frank Sinatra and a million others who sang it, is the best know of these; the runner-up for general appeal is Pirate Jenny, made famous in the German version by Lotte Lenya, Weill’s wife, who starred as Jenny in the original 1928 production. Otherwise, the music is notably dark and moody, tonal but edged with echoes of the twelve-tone experiments going on in Vienna at the same time. This production by a company which specializes in and excels consistently with opera seems to have commandeered mostly opera singers to perform a good deal of the non-singing dramatic tasks. Much of the show, particularly in the first half, is without music. On the work’s own terms, that absence is curious since the extremely thin narrative does not, on its own, really have enough to support itself dramatically. One imagines that Weill might indeed have been on vacation and had only so much time to bang out music for what he might have well thought, at the time, was a kind of goof. 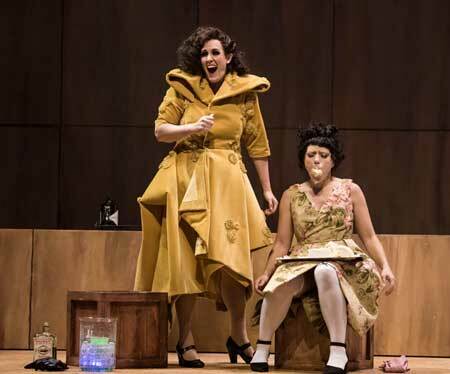 In any event, it is asking a lot to expect opera singers to carry a hugely pantomimish comic act, largely without music, on their own shoulders. The stage director, James Darrah, seems to have thought that by giving them directions to be extremely broad and clownish it would provide hilarity and bawdy entertainment; the result is not that. Instead of dramatizing the little bit of the substance of the characters that are there, there is so much mugging and exaggerated expression that very little of the characters themselves come through. This BLO production, as do most of them generally, has a great orchestra. It’s a very pared down version of the usual BLO orchestra, with mostly woodwinds and some interesting instrumentation including saxophone, organ and banjo. David Angus and the musicians do a superb job of filling out the musical spaces. When there is singing – and it occurs more in the second half fortunately – some of it is very good. In particular, Christopher Burchett as Mack the Knife sings beautifully. He has a lovely tenor and have several significant solo arias through which to prove it. Chelsea Basler, as Lucy, who shows up in the second half, has a powerful voice, and, Kelly Kaduce, as Polly, between her extreme mugging as an actress, belts it out pretty well also when she gets the chance to sing. Burchett (Mack) and Basler (Lucy) are also very good actors and have compelling presences onstage, which goes a long way to giving dramatic substance to a show that is narratively wanting and to a production that provides an abundance of broadly histrionic portrayals. Things improve considerably in the second half, mostly because there’s more music and because Burchett’s Mack The Knife and Basler’s Lucy have much more air time. There’s also a bit between Lucy and Polly which works quite well and is indeed pretty hilarious. The lighting by Pablo Santiago and much of the general conceptions of the staging are very effectively done.